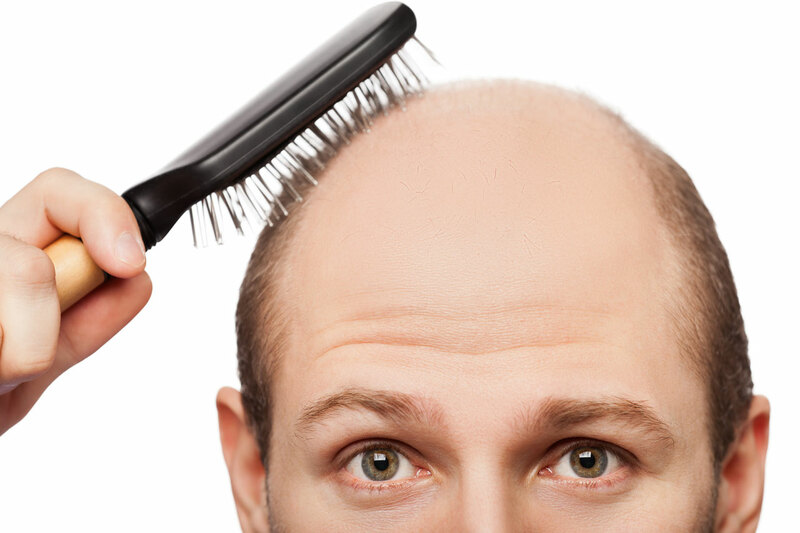 Male hair loss is otherwise known as androgenic alopecia. Common causes are male hormones, called androgens, on hair follicles that are genetically predisposed, meaning they are passed down in families. In men who have these genetically programmed hair follicles, their testosterone is converted into the androgen Dihydrotestosterone or DHT. This is caused by the enzyme 5-alpha reductase. The impact of this DHT leads to hair loss and in most cases, baldness. Men commonly lose hair on the top of the head. Therefore, balding men are usually left with hair on the sides and back of the head. Why only the hair follicles on the top of the hair are sensitive to DHT continues to baffle scientists. Loss of hair in women is commonly caused by telogen effluvium. This is when a sudden event or severe stress can cause certain hair follicles to prematurely stop growing and enter the telogen or “resting” stage. After three months of remaining in this stage, the hair will begin to fall out. In many cases, this is a temporary process and hair will recommence growing. It can take longer in other cases until the underlying issue is resolved. Common causes of telogun effluvium are childbirth, severe emotional stress, dieting drugs, starting or stopping birth control pills, therapy, and pregnancy terminations. Other causes of hair loss that continue until the cause is treated are anaemia, diabetes, thyroid gland malfunction and systematic lupus erythematosis. No hair loss treatment guarantees permanent results. The outcome varies from person to person. A common treatment recommended to men and women is minoxidil, which is a liquid that is applied directly to the affected area daily. The results are usually visible after three months of continuous use and some people may have to use it perpetually to maintain the results. For those seeking alternative natural treatments, ancient Indian and Chinese herbal remedies are optional. According to Indian ayurveda, hair loss can be caused by many factors such as lack of vital vitamins (B6, folic acid, calcium, etc.) heredity, stress, poor blood circulation, exposure to chemicals and treatments (colouring, hair straightening, etc.). Ayurvedic treatment promotes healthy eating and regular exercise. Recommended home remedies include regularly massaging the scalp with coconut or almond oil to promote blood circulation, apply a mixture of honey and egg yolk to the hair half-an-hour before washing, meditation, yoga, drink half-a-cup of aloe vera juice daily. There are many more treatments that can be applied directly to the hair. Chinese medicine could involve taking herbal mixtures daily for months. Other treatments include meditation and acupuncture.